Pharmaceutical industry has been increasingly using single use systems (SUS) for bioprocessing and storage of intermediate and final bulk material in addition to primary packaging. Before a SUS could be used in the manufacturing process, it needs to be qualified for use by a pre-determined process. 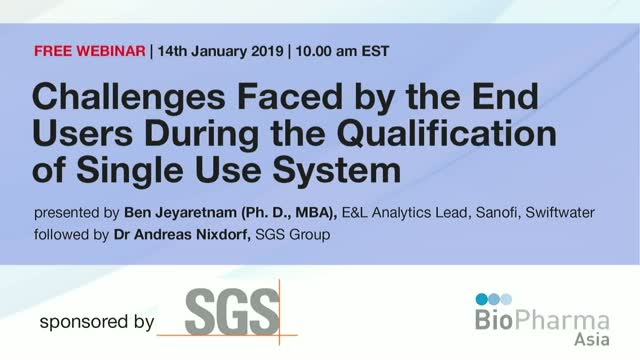 This presentation will discuss a variety of challenges, both internal and external to the industry that the end use faces during the qualification process. Complexity of SUS, varying quality of vendor data, component change management, changing regulatory expectations, analytical data generation, logistical challenges during E&L study execution, analytical challenges, and the potential impact of unexpected E&L study results will be presented.